Thai Square The Strand is the eldest in the Thai Square chain. 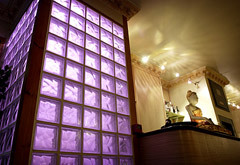 Opened in 1996 it aims to serve tasty, authentic Thai food in Thai-inspired surroundings. The walls are adorned with hand-crafted Thai artefacts with bare wooden floors, simple wood seating and good lighting creating a pleasant modern look. It’s the perfect place to meet for a pre or post theatre meal, It’s location in the heart of London on The Strand, close to Covent Garden and Charing Cross Station, makes it ideal for theatre-goers and Thai food lovers alike. Service is friendly and genuine. Good value for money. The restaurant can accommodate up to 100 guests for business lunches, birthdays and get-togethers. Exclusive hire is available at request. Although there�s only one dinning area it splits evenly into a front and back section, each holding around 50 guests. The extensive menu features a range of exquisite dishes made from authentic Thai ingredients freshly flown from Thailand. This includes all your favourite curries, fragrant noodle and rice dishes as well as a healthy selection of vegetarian options. Dishes are beautifully served and flavours are intense & punchy, diners with a more European taste simply need to ask for their favourite dishes with a little less spice and the chef is happy to oblige.